Not to be confused with the as of yet unestablished upper house of the Parliament of Georgia, anticipated by the constitution of 1995, which is also styled the "Senate". For the current session, see 155th Georgia General Assembly. 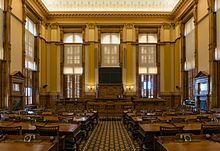 The Georgia State Senate is the upper house of the Georgia General Assembly (the state legislature of Georgia, USA). According to the state constitution of 1983, this body is to be composed of no more than 56 members elected for two-year terms. Current state law provides for 56 members. Elections are held the first Tuesday after the first Monday in November in even-numbered years. Senators must be at least 25 years old, a citizen of the United States, and a resident of Georgia for two years and their senatorial district for one year (preceding the election). The highest position in the Senate is the President of the Senate, a position currently held by Lieutenant Governor Geoff Duncan. The second highest position is that of President Pro Tempore, currently held by Senator Butch Miller. The presiding officer of the Senate is the President of the Senate. A President pro tempore, usually a high-ranking member of the majority party, acts as President in case of the temporary disability of the President. In case of the death, resignation, or permanent disability of the President or in the event of the succession of the President to the executive power, the President pro tempore becomes President. The Senate also has as an officer the Secretary of the Senate.